You need to call San Pedro de Macorís cheap, but it’s hard to find a phone service that’s both high quality and low cost. We know how that feels, which is why we developed the Vonage World Plus Latin America 100 plan. It lets you enjoy unlimited¹ calling to San Pedro de Macorí without all the hassles of calling cards and minus the high costs of many Latin America calling plans. There’s no reason you should be stuck with a certain number of minutes on your plan. Why bother with cards or plans that restrict your calling time? 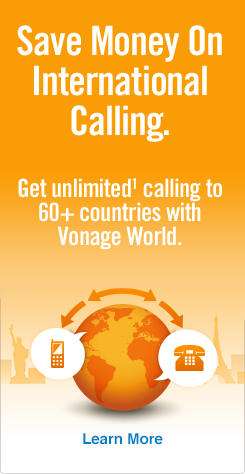 For a low monthly rate, Vonage World Plus Latin America 100 lets you enjoy unlimited¹ calls to landlines in San Pedro de Macorís. You can also enjoy unlimited¹ calls to the rest of the Dominican Republic and to the US, Canada and Puerto Rico! And if that’s not far reaching enough, we also include the same unlimited¹ calling to over 60 countries, 8 of which are Latin American. The plan also comes with a complimentary 100 minutes to cell phones in San Pedro de Macorís! If you need to call mobiles after using those 100 minutes, there’s a very low per-minute rate that won’t break your bank. 1) Start with 1 — the country code for the Dominican Republic. 2) Next, enter 809 — the San Pedro de Macorís area code, part of the North American Numbering Plan. 3) Finally, dial the 7-digit local phone number. Other area codes in the Dominican Republic include 849 and 829. To dial other major cities besides San Pedro de Macorís, read our how to call the Dominican Republic from the US guide! Now that you’ve got the reliable and affordable calling part down, read on to learn more about San Pedro de Macorís. Though San Pedro de Macorís is a Dominican city and province through and through, it was, in fact, settled and created by Cubans who were fleeing their country’s War of Independence in the late 1800s. Thanks to its Cuban heritage, San Pedro de Macorís is still one of the world’s most famous sugar cane producing and processing areas. There is also no shortage of fun for baseball enthusiasts, as San Pedro de Macorís is home to a large number of MLB players. We hope this background on San Pedro de Macorís was helpful and you’ll want to find out more about our Vonage World Plus Latin America 100 plan and get calling ASAP!